The BMW X5 SUV features a turbo inline, six-cylinder diesel engine, delivering a formidable 0-62mph in 6.5 seconds. With a top speed of 143mph at your command, you’ll lead from the front. Enjoy its xDrive, all-wheel-drive system, with ultra-modern 19-inch alloy wheels. Introducing the BMW X5 M50d. Unleash driving power, with a TwinPower Turbo inline, six-cylinder diesel engine delivering 400hp, taking you from 0-62mph in 5.2 seconds. The BMW X5 features Vernasca leather upholstery as standard, and a stunning colour array with its Sky Lounge panoramic glass roof. Experience this SUV’s Bowers & Wilkins Diamond sound system as standard, and stylish, clearer controls with the CraftedClarity Glass application. Elsewhere in the cabin, rear touch screens come as an optional extra. 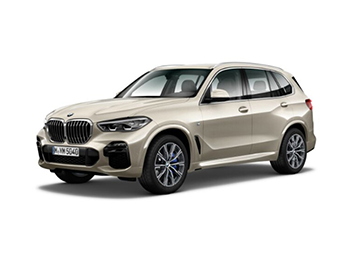 The X5’s Laserlight technology illuminates your way up to 500 metres ahead, while the new BMW 7.0 operating system works seamlessly using gesture and voice control, via a sleek larger touch screen and iDrive control pad. Going somewhere different? Rule every terrain with the X5’s optional xOffroad pack, which features four new off-road driving modes, extra bodywork protection and sturdier controls.